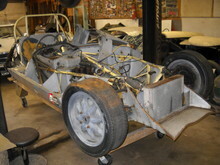 There is no branch of motor sport on four wheels for which Eric Broadley's Lola has not built cars. Lola has produced everything from club racers to cars for the Indianapolis 500, and Formulae 1,2, and 3. At the end of the seventies, Lola was the largest constructor of racing cars in the world. Their most famous cars were the T70 and the Mk 6, the latter of which was the basis for the Ford GT40. Lola cars were generally not intended for the open road but an exception was the first Lola with which Broadley began his career. The Mk 1 can be driven on road or track.